David De Gea's exceptional display saved Manchester United's blushes as Jose Mourinho's men somehow escaped with a goalless draw from a match dominated by Sevilla. Wednesday's trip to the Estadio Ramon Sanchez Pizjuan was the Red Devils' first Champions League last-16 match since 2014, but their performance in this first leg was one to forget. 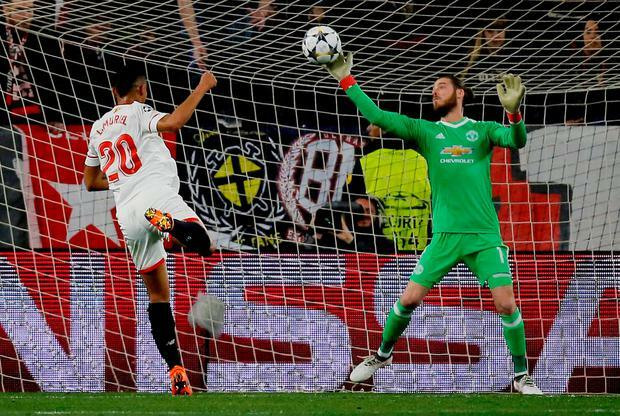 United struggled to contain Vincenzo Montella's Sevilla throughout a one-sided contest, with De Gea required to produce a string of saves - including an incredible first-half stop to deny Luis Muriel - as proceedings somehow ended 0-0. A night that started with Paul Pogba dominating the agenda after being named on the bench ended with United's goalkeeper grabbing the headlines thanks to a man-of-the-match display in his homeland. Disjointed United were unimpressive throughout and De Gea was forced into five saves in the first half alone, with his one-handed stop from a Muriel header leaving onlookers open-mouthed. Sevilla continued in the ascendancy after the break and racked up 25 attempts over the course of the evening - but none found the back of the net as Mourinho's men somehow returned to Old Trafford unscathed. The travelling support even thought they had an undeserved winner to celebrate, only for Romelu Lukaku's late effort to be ruled out. Sevilla's fans were noisy throughout and their intensity was matched by their team, with Muriel setting the tone with an effort bound for the bottom corner until De Gea's intervention at full stretch. The hosts continued to threaten United's goal as Ever Banega and Jesus Navas tried their luck safe in the knowledge that Mourinho's men were creating little at the other end. Pogba's introduction in place of the injured Ander Herrera brought some much-needed creativity and composure, but it was Alexis Sanchez that unlocked the home defence with a lovely clipped ball volleyed over by Lukaku. Surprise inclusion Scott McTominay's 25-yard effort represented United's only shot in target in a first half that Sevilla would have gone ahead in but for De Gea. Joaquin Correa, a nuisance down the left, twice forced the Spain goalkeeper into action, before the Spain goalkeeper superbly tipped over a glancing Steven N'Zonzi header. However, the best was yet to come. Just moments after being involved in a defensive mix-up, De Gea produced an incredible one-handed stop to prevent a point-blank Muriel header rippling the net. Montella opened his arms in disbelief and gasps followed from the crowd when replays were shown at half-time. The LaLiga side continued to knock on the door after the break as Muriel threatened, Clement Lenglet got a tame header on De Gea's goal and Correa danced into the box. Banega sent a free-kick straight into the United goalkeeper's grasp as those in front of him continued to falter, with Pablo Sarabia nodding just over at the far post and Muriel fizzing an effort at De Gea's goal from an acute angle. Seven minutes from time, it looked like United had pulled off the smash and grab as Lukaku's fierce strike squirmed past Sergio Rico, only for the goal to be cancelled out for handball. Substitute Sandro Ramirez was blocked and former Manchester City winger Navas had a penalty appeal ignored, with Marcus Rashford fizzing a free-kick wide at the other end.